My "Night Time In New Orleans" Bracelet Set is inspired by the sights and sounds of New Orleans as well as the 'Sweet Neon' palette by Design Seeds. 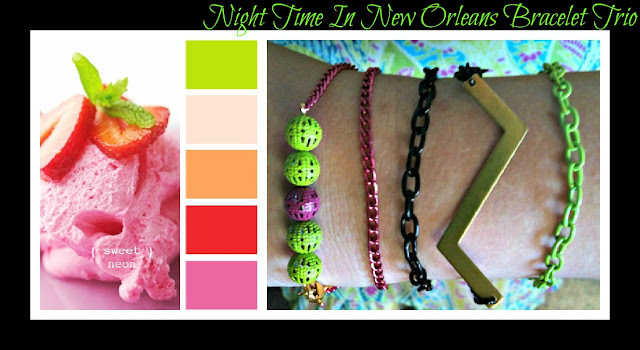 This trio of bracelets features the NOLA friendly colors of black, gold, lime and purple-y pink. Wear alone or mix and match for a fun arm party presentation! Both double chain bracelets are 15" & the green bracelet is 7.5". The set is available via Etsy or Storenvy and retails for $25. All items come gift packaged. If you need a different size, I will happily make a custom order for you.